Few people, even in the Navy, are even aware of this dreadful incident [the loss of submarine HMS Truculent in the Thames] and certainly not the details of human error that led to this huge loss of life. The account is gripping, and explains the strange title of the book. 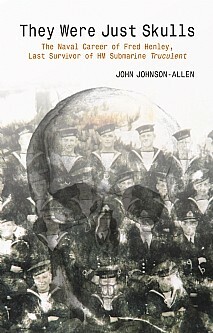 ... John Johnson-Allen has put Fred Henley’s personal accounts in the context of world-changing events, and in particular provides a wonderful snapshot of the Royal Navy of that era. This compelling story is the result of many hours spent recording the memories of Fred Henley. His life at sea is at the centre of his being and his own words are at the heart of the book. At the age of 14 Fred worked on a Thames sailing barge, then after his training at HMS Ganges, he joined his first ship which took him from the icy Arctic Ocean to the heat of West Africa where the Bismarck and her support ships were hunted. His experiences included visiting Archangel, sailing on Arctic convoys, capturing German supply ships, the failed attack on Oran, landings in Piraeus, Salonika and the French Riviera and operating with special forces in the Greek Islands. There is inevitably some humour when Fred recounts his encounters with girls. The book then explores the tragic loss of his last submarine, HMS Truculent. In the cold January waters of the Thames Estuary, within sight of Southend, over 60 men were lost in a major disaster, just five years after the end of the war. The voices of the survivors are heard telling how they stood in complete blackness in a sunken submarine, waiting for the water to come in so that they could escape to the surface, only for all but a few to drift away and die in the darkness. The story concludes with happier times with Fred visiting ports in the Mediterranean during peacetime as a married man. This historical biography will be of interest to members of the Royal Navy, submariners and everyone with an interest in naval and military history, maritime history and memoirs.